The Indian Premier League 2019 opener was not a good game for Royal Challengers Bangalore. But RCB’s spinner Yuzvendra Chahal will remember the game for a long time. Chahal returned with impressive figures in his quota of four overs as he gave away just six runs and picked a wicket as well. Chahal with this has now conceded least runs in a four-over spell in an IPL match in India. CSK vs RCB IPL 2019 Highlights. Fidel Edwards while playing for now-discarded Deccan Chargers against Kolkata Knight Riders and Ashish Nehra while playing for Delhi Daredevils (now Delhi Capitals) against Kings XI Punjab gave away six runs from their quota of four overs as well but the pacers achieved the feat in South Africa during IPL 2009. Ten years later, Chahal conceded least runs in a four-over spell in India. The spinner opened the bowling for RCB and bowled a maiden over. In his second over, Chahal bowled former Australian all-rounder Shane Watson to give RCB some hope. 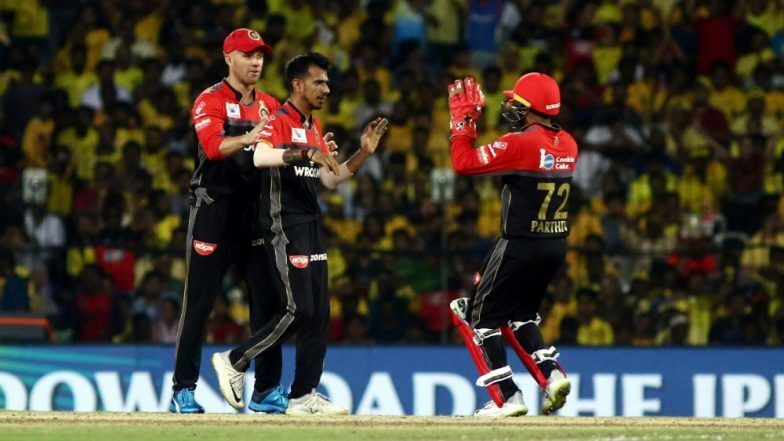 CSK vs RCB IPL 2019 Stat Highlights: Harbhajan Singh, Imran Tahir Shine as Chennai Super Kings Registers Convincing Win. Chennai Super Kings then completed the chase of paltry 71 runs in 17.4 overs and lost three wickets in the process. Apart from Chahal, Moeen Ali and Mohammed Siraj chipped in with a wicket each. Suresh Raina Becomes First Batsman to Complete 5000 Runs in IPL. Put to bat first, RCB batsmen failed to counter Chennai bowling and were bundled out for just 71 runs. Spinners Imran Tahir and Harbhajan Singh picked three wickets each to bamboozle the Bengaluru based franchise. Ravindra Jadeja picked two wickets. Meanwhile, this was Royal Challengers seventh consecutive defeat against Chennai Super Kings. The defending champions will next face Delhi Capitals on March 26 while RCB will be up against Mumbai Indians.